I think most quilters have a soft spot in their heart for scrap quilts. They were the first antique quilts that I responded to long ago. I now know why. 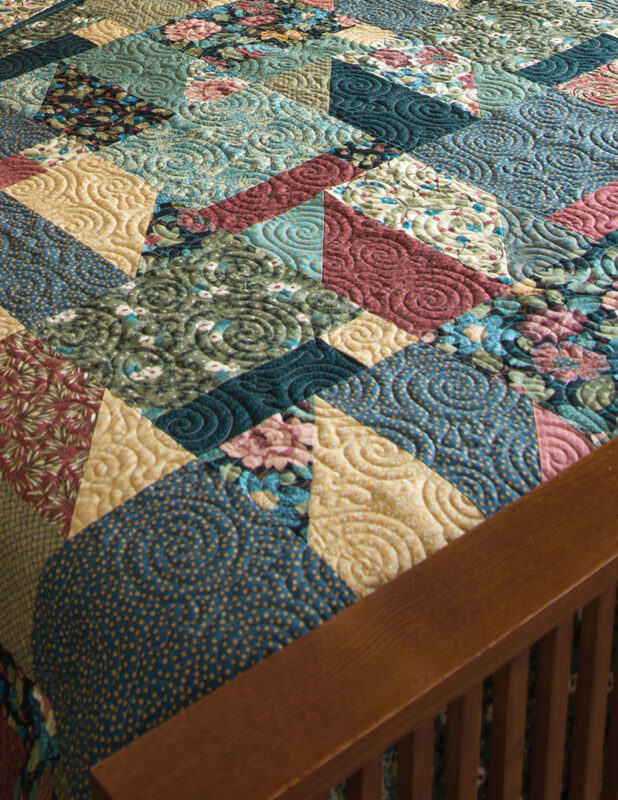 Even then, I loved quilts that had large variety of prints in them and I think they reminded me of the resourcefulness of women that made very functional items from ordinary scraps. We since have moved into an era of some pretty wonderful collections of beautiful fabrics and have many choices of “scraps” to use for scrap quilts. 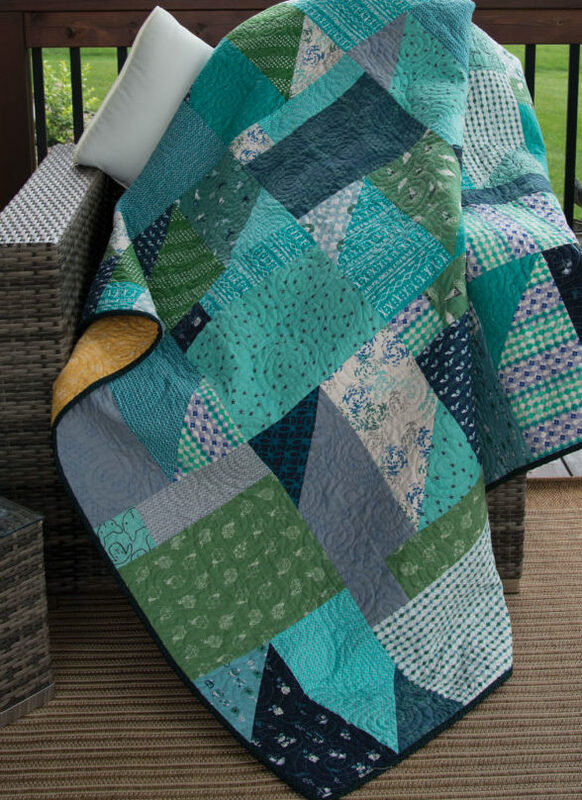 Scrap Ease, found in my new book, Quilts with a New Attitude, is now my very favorite scrap quilt. The book shows it in a queen size made from Thimbleberries fabrics and a throw size made in a coordinated collection from Cotton+Steel. The piecing is easy, the cuts are big and the overall design very pleasing. It has no border so it is to adjust the size if you need something other than the two sizes included in the book. I just keep wanting to make more of this quilt design. It would be so fun made in baby or kid prints….and Christmas prints and Halloween prints and the list goes on. 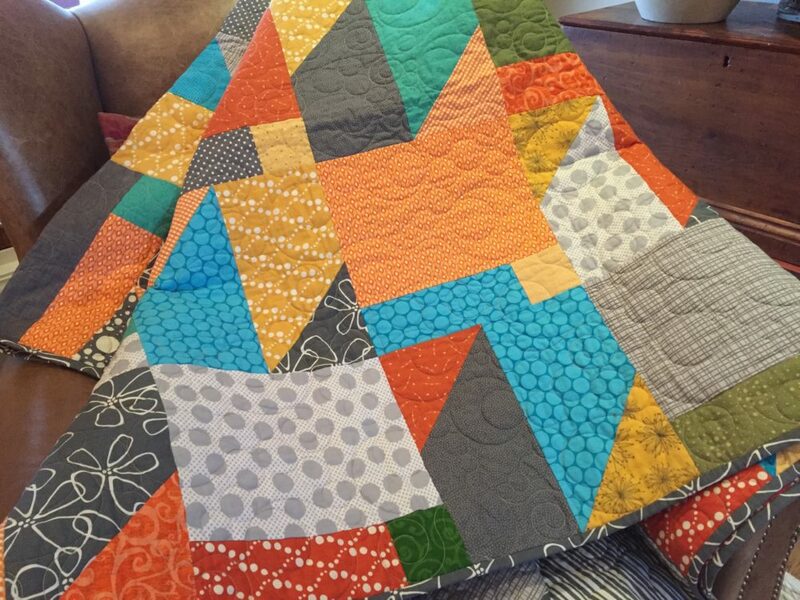 A simple machine quilting design works well on this quilt. Here is another version of the Scrap Ease made in another, rather wild collection of scraps. When piecing the units for one portion of the quilt, you will get pairs of triangles that are trimmed off and technically waste. I used my leftover triangles to make this narrow, long runner….I love it. Hi, Lynette. I have just visited the quilt shop, Sew Elegant, in Ft. Gratiot, Michigan. For any of your readers looking for Thimbleberries fabric, this would be a good shop to try. Two long rows, two shelves high of your fabric. It felt like coming home! Absolutely love your new book. My collection continues! 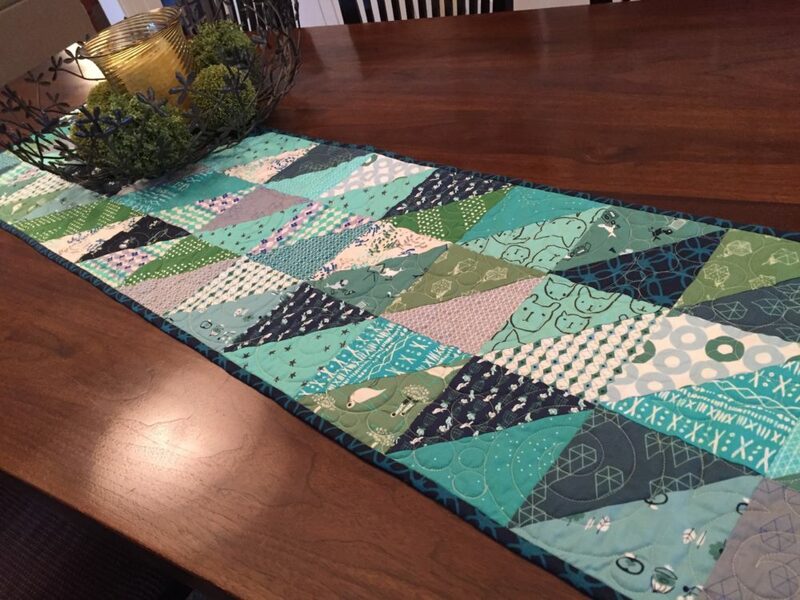 Table runner in blue/turquoise tones…..just can’t go wrong with half square triangles, can you? They are my “go to” favorite. What a fun look. . .your pictures are great! Will be looking forward to seeing all the projects in the book. There is never enough time to use up all my scraps!!! I love the quilts! Beautiful, I want to make them for my granddaughters for Christmas. Nice pattern. Love scrap quilts! P.S. I just ordered the book and can’t wait to get it! I love it! And I love the idea of making it from holiday fabrics. I have a large stash of Halloween fabrics and could use the table runner for Halloween decorating as well. I especially love the large, quick blocks and the simplicity of making it as large as needed. Thanks for yet another inspiring project!